"Paper cup from a sheet of paper"
Paper flowers, though not possess the aroma of living plants, but in no way inferior in beauty and grace. In this section, find the best scheme of paper flowers in the style of origami . Good luck to you !!! Tea rose origami is a perfect gift for your loved ones. Folding process model is not very complex, but may require a creative approach in some places. Little technical issues..
Gorgeous bouquet of origami-style, they can be decorated with any card and please your loved ones. You can make any changes to it, which is closer to you. Just want to warn you that you will need patience and knowledge of basic techniques to cope with this task. Simple origami from square sheet of paper, can be done even from the sticker. Easy performed a small miracle that can be used in the decorations in the interior and applique. Elegant gift box origami-style, with a rose on a lid. Manufacturing Boxes shown in detail in a video instruction. One of the best books on origami flower, contains a variety of high-quality patterns of flowers, leaves, twigs, etc. Complexity about average. 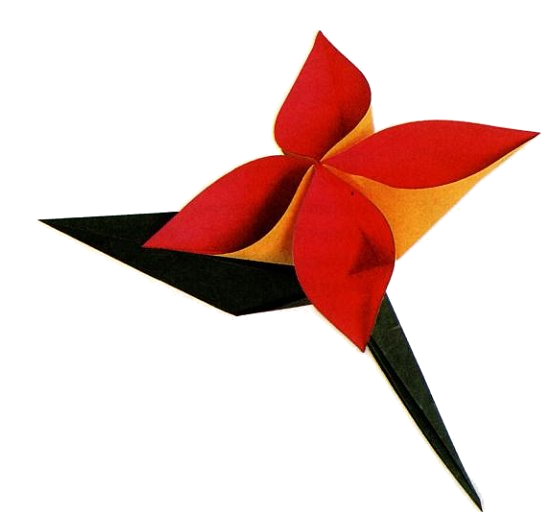 The book contains a lot of quality schemes origami flowers. Schemes are very detailed. and the book itself is very bright and colorful. For lovers of origami flower necessarily advise download. Beautiful stand for dishes with a flower in the style of origami. This model complements your decor, and bring some zest. It is advisable to use a thick glossy paper measuring at least 15 x 15cm otherwise the latter stages will be difficult to make the necessary settings. Easy to manufacture tulip paper origami-style. Bud is formed on the basis of the basic forms of a double square and petal in turn begins with BF kite. This is perhaps the most popular option scheme Tulip origami-style. This model is ideal for familiarizing children to the art of origami, as it requires no complex actions. Another very popular model is related to the classic tulip oregano. The difference between this tulip from the rest is that the bud looks like blossoming tulip. Traditional Japanese kusudama is one of my favorites, because you do not need to use glue but you can just sew the flowers together. These flowers are very easy to fold and there are many different options for how to make different kusudamy using the same flowers. This is a great origami model Waterlily. Its main advantage is that it can easily be folded at the table of ordinary cloth.